July 9: I rewatch some YouTube videos from last week to make sure I haven’t forgotten everything I’ve learned in 9 days. I set a goal to get out some real cards this week before I head to Vegas. I’m starting to doubt if I can do this without feeling stupid in Vegas. July 10: Friday. My plans were to go to work and then meet up with the ladies in my neighborhood for dinner. Normally I spend the hour or hour and a half between work and dinner roaming very important places like Marshalls and Home Goods. 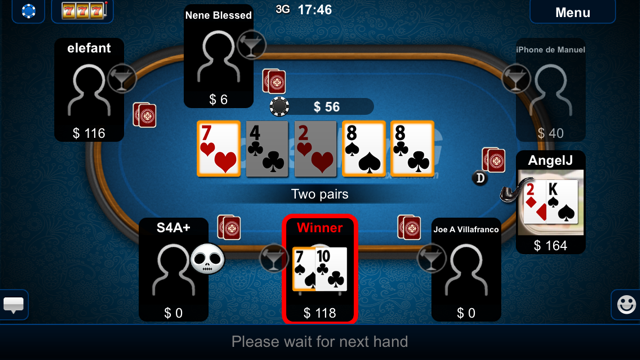 Today, I spent about an hour playing my newly downloaded Texas Hold ’em app called “poker king” (again, still a bias towards men. Note to self – develop “poker queen” app) while sitting in the Home Goods parking lot. First of all….the first screen I see is this: “you do not have any friends online.” Great. I may not have any friends, but looks like I have $800 virtual cash! I was disappointed to see that my screen name was the default name I used when I registered with apple so my little person was called “Brooke’s iphone” – not the poker persona I was going for. 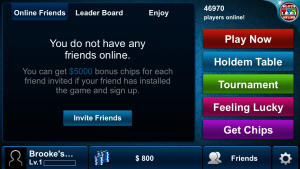 I pretty much had no idea what I was doing, mainly because of the app, not because I didn’t know how to play poker. Or because I didn’t really know how to play poker. They gave you the option to “call” “check” or “raise” and I could not figure out the difference between “call” or “check.” So much so, that in the little text box where people normally type trash talk type of comments, I actually typed “what’s the difference between ‘call’ and ‘check'” as if my new found online friends were going to help me. No one responded. So again, I typed “what’s the difference between ‘call’ and ‘check. '” No response. Maybe the login screen was right. I literally do not have any friends online. I decide to just hit buttons I hadn’t hit before. I win. I take a virtual sip out of my virtual martini. Mandalay Bay – play between 8am-10am because you’re likely to play against guys who are in town for a convention and want to get in a few hands before a conference. He said they just want to make a few bucks so badly they will play weak hands or call or raise on small or middle pairs. This guy’s tips are so great he even suggested bringing a sweater because the poker room is cold here. Bellagio (home of the nutella crepe that I so adore) – I think I’ll basically be eating my nutella crepe here and playing slots. He says there’s a tournament Sun-Thurs with a satellite buy in of $130 (I don’t know what satellite means?). The guy said the weekends draw serious players here and only play if you’re a high limit player. Monte Carlo – apparently this is where the drunks play. Low limits and and long waits. MGM Grand – this is on the other side of the strip from where we’re staying (The Venetian) so it’s not worth the walk for me but he said you can play the “drunk tourist factor” here late at night. He says you will always find a first timer at your table here and the players are a notch below the other casinos I listed above. Maybe it is worth the walk?! July 13: I already had a 12-1pm entry on my calendar for “Lunch (poker)” with a coworker so I knew I’d have another fake game/discussion on table etiquette/rules under my belt. 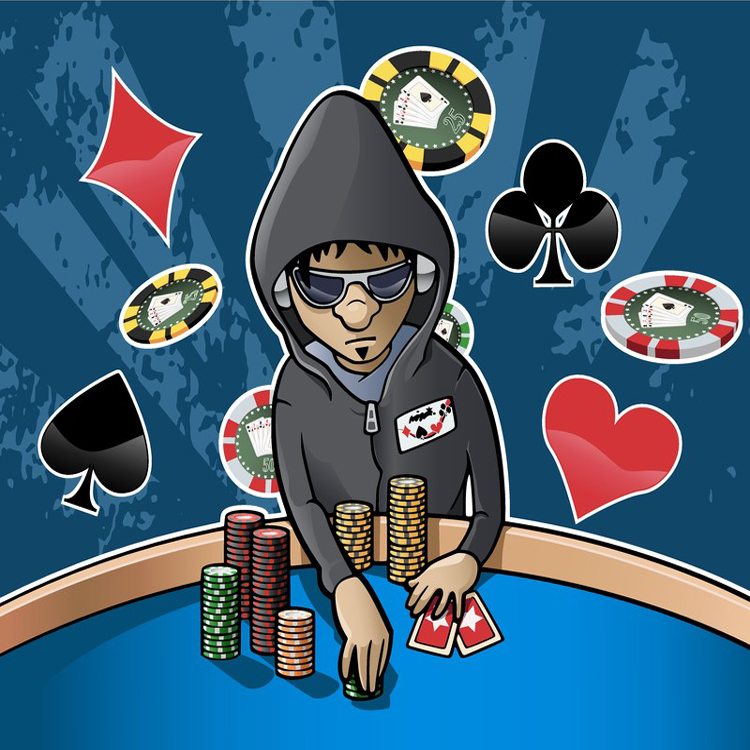 It was another chance for me to ask those so-called “dumb” questions like “should I get my chips before I get to the table or once I’m there?” and again, “when exactly do we do the ante?” I don’t know why I can’t get over this ante situation. I guess it’s because it’s the first thing done before cards are dealt and I have this fear I’ll miss it or mess up before anything is even dealt. My coworker tells me that I’ll see everyone else doing these things and I’ll pick up quick. I get my cards out and we play a fake game with some narration in the middle to answer additional betting questions. I bet $5,000 fake dollars. He calls. I win. I go to the bank and withdrawal my real cash for my Vegas trip ($500 of which is dedicated to poker if you’re curious. I feel like that’s a fair amount based on asking around/my rookie status). I leave work feeling overly confident. I leave for Vegas in 2 days. It looks like my first real game is going to be in Sin City after all. Bexley, Alum Creek Greenway Trail & Gahanna Woods….or not.